New York, NY — (May 4, 2018) An afternoon Island Celebration! The Theatre World Awards Board of Directors, Dale Badway, President, have announced, today, the 74th Annual Theatre World Awards Ceremony will take place at Circle in the Square on the set of the TONY Nominated Broadway Revival of Once on This Island on Monday afternoon, June 4, 2018 beginning at 2:00 p.m. The attire for the afternoon event is ‘Festive Island’ wear. A TWA Island Party reception will follow the ceremony at The Copacabana Rooftop. Circle in the Square Theatre is proud to host the only major theatrical award ceremony scheduled in a Broadway house, this season. Hosted annually by well-known theater journalist, Peter Filichia, the 74th Annual Theatre World Awards ceremony will be produced by Theatre World Awards, Inc. Board of Directors, and Stephen Nachamie is set to direct the afternoon’s activities. Theatre World Award Alum Victor Garber (Hello,Dolly!) will receive the 6th Annual John Willis Award for Lifetime Achievement In The Theatre, celebrating his 46th year on the Broadway stage. Victor Garber, with six Emmy® and four Tony® nominations to his credit, has been seen in some of the most memorable works of film, television and stage. He co-starred in Ben Affleck’s Academy Award®-winning film, Argo and portrayed San Francisco Mayor George Moscone in Gus Van Sant’s Academy Award®–nominated film Milk. Additional film credits include The First Wives Club, Sleepless in Seattle, Legally Blonde, and the Academy Award®-winning film Titanic. Mr. Garber has co-starred with Ryan Reynolds in Self-Less and with Emily Blunt in Sicario. Mr. Garber earned four Tony® nominations for his work in Damn Yankees, Lend Me a Tenor, Deathtrap, and Little Me. He performed in the workshops of Sondheim’s Assassins and Wiseguys as well as in the Tony Award®–winning play Art. His stage credits also include the original Broadway productions of Arcadia, The Devil’s Disciple, Noises Off, and Sweeney Todd. Additionally, Mr. Garber garnered rave reviews in Sondheim’s Follies for City Center Encores! And most recently, Present Laughter, directed by the late Nicholas Martin. At Circle in the Square, he appeared in Tartuffe (1977), You Never Can Tell (1986-1987) and The Devil’s Disciple (1988-1989). He can currently be seen in the Broadway hit, Hello Dolly!, playing Horace Vandergelder opposite Bernadette Peters. Stephen Nachmie (Ceremony Director). Broadway: She Loves Me (2016 Broadway Revival – Associate Director to Scott Ellis- also “PBS Great Performances” and Broadway HD). Film/TV: Director of Macy’s Singing Christmas Tree – “Macy’s 91st Thanksgiving Day Parade” and NBC TV’s “ BANG! BOOM! POW!” (with John Wesley Shipp and Nicholas Barasch), Winning New York – Winner Audience Choice Award – New Filmmakers NY Festival. 2018 Honorees for the Theatre World Award for an Outstanding Performance in a Broadway or Off-Broadway Production, and the 10th Annual Dorothy Loudon Award will be announced shortly. The Theatre World Award winners are chosen by the Theatre World Awards Committee which is comprised of Roma Torre (NY1), David Cote (Time Out New York, Emeritus), Joe Dziemianowicz (New York Daily News), Peter Filichia (The Newark Star-Ledger, Emeritus) Harry Haun (The Observer), Elysa Gardner (USA Today, Emeritus), and Frank Scheck (The Hollywood Reporter). Previous winners who have won the prestigious Theatre World Award at the beginning of their careers include Meryl Streep, Rosemary Harris, Marlon Brando, Julie Andrews, Christopher Plummer, Anne Bancroft, James Earl Jones, Liza Minnelli, Alan Alda, Zoe Caldwell, Christopher Walken, Alec Baldwin, Bernadette Peters, Audra McDonald, Al Pacino, Grace Kelly, Tom Hanks, Bryan Cranston, Cynthia Erivo, Danielle Brooks, Lupita Nyong’o, John Krasinski, and so many more. The Dorothy Loudon Award for Excellence in the Theater honors an Outstanding Performance in a Broadway or Off-Broadway production. Dorothy Loudon, who had the unique talent of being able to make audiences laugh and cry, made her Broadway debut in Nowhere to Go But Up for which she received a Theatre World Award for her performance. She received a Tony® Award for her incomparable performance as ‘Miss Hannigan’ in Annie, and went on to triumphs originating roles in Noises Off, Westside Waltz, and Michael Bennett’s Ballroom. Previous recipients of the Dorothy Loudon Award for Excellence in the Theater include Katrina Lenk, Nicholas Barasch, Leanne Cope, Celia Keenan-Bolger, Jonny Orsini, Susan Pourfar, Seth Numrich, Bobby Steggert, and Susan Louise O’Connor. The Dorothy Loudon Award for Excellence in the Theater is chosen by the Trustees of The Dorothy Loudon Foundation, Lionel Larner, Executive Director, together with recommendations from the Theatre World Awards Committee. The Theatre World Awards Board encourages theater lovers to “LIKE” the Theatre World Awards fan page on Facebook at www.facebook.com/TheatreWorldAwards/ and follow on Twitter at @TWAwards. The annual published book, Theatre World, remains the definitive record of the American theatre season, including photos and statistics from Broadway, Off-Broadway, Off-Off Broadway, and regional companies, in addition to special sections dedicated to obituaries, long running productions, and major theatrical awards. Theatre World is edited by Ben Hodges and Scott Denny, published by Theatre World Media and distributed by Applause Theatre and Cinema Books, a division of Hal Leonard Performing Arts. 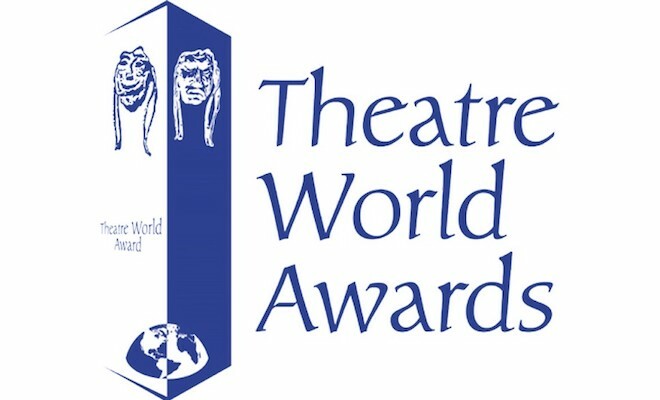 For additional information about the Theatre World Awards, visit www.theatreworldawards.org. ← Previous Story Paper Mill Playhouse has a Dance Contest for you.